I finally got to test the released version of the RIM BlackBerry PlayBook and here are my impressions of the PlayBook - the good, the bad and the ugly. The PlayBook is a 7 inch tablet device with a new operating system by RIM. I am a fan of the 7 in format as I already determined when I tested the Samsung Galaxy. The 7 inch format is big enough to get a decent browser experience and to be able to type and yet it makes the device immensely more portable. The device has two cameras and an HDMI slot, although I didn’t find any SD card slot to my disappointment. The PlayBook has a very sharp looking display. The resolution is 1024x600 which is more dpi than the iPad with 1024x768 given its smaller screen size. I like the user interface of the new PlayBook OS (QNX) which makes the app interaction very easy - it is much more obvious about which apps are currently running compared to the iPad. Talking about the UI, I have to mention the Flash support which is something iPad doesn’t do. That said, I am not so sure lately I really want Flash to survive, given the abundance of invasive Flash adds. I do realize though that the advertisers will find another technology to annoy me with their ads if they don’t have Flash. Finally, I like the standard set of applications that come with the PlayBook. 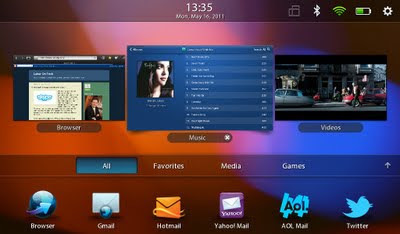 Besides the usual suspects such as browser, music player, picture viewer etc., the PlayBook also comes with a set of office applications called Word To Go, Sheet To Go, and Slideshow To Go. I’ve tried to open up a couple of Office documents and I was positively surprised to see a pretty decent fidelity of a PowerPoint deck - something the Keynote app on the iPad still struggles with. That said, don’t expect to be able to use a complex Excel spreadsheet with pivot tables. There were a few things I didn’t like about the PlayBook. First, the device is surprisingly heavy. With 425 g, the device is too heavy to hold comfortably in one hand for a long time - i.e. when reading a book. The iPad weighs 607 g which is much more but given its size, the weight is not that surprising. The Samsung Galaxy weighs 385 g which is less but even that was too much for reading when I tested it. The Kindle only weight 241 g which is why it is such a successful reading device. 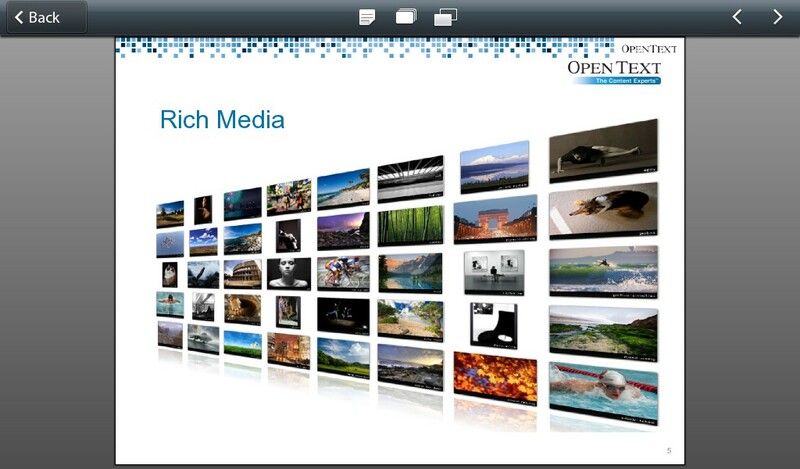 I was impressed by the fidelity of PowerPoint decks opened on the PlayBook's native Slides To Go app. Many people have reported about the hard to use power switch. It is really, really hard to engage - the designers clearly haven’t tried the button themselves. That said, you don’t need the power button much - a simple sweep on the screen wakes up the PlayBook from hibernation. I did like the volume buttons that some of the reviews criticized. My iPhone and iPad have them too and I use them all the time. While the PlayBook hardware appears very slick, the software was clearly a bit rushed. The PlayBook has no native calendar or email client. To use email, the PlayBook has to be tethered to a BlackBerry (smartphone) via a bluetooth connection which I wasn’t able to test since I traded my BlackBerry in for an iPhone not long ago. This limitation will likely go away in some future update but right now, the tablet’s usefulness is limited without email which is my number one application on the iPad. In the end, it is all about the software - most notably the apps. And that’s where the PlayBook has its work cut out. The BlackBerry has been only slowly trying to catch up with Apple and Google in apps availability but the PlayBook OS (NQX) is distinct from BlackBerry and there are only a handful of apps available. While the PlayBook has in theory most of the apps one would need for work - let’s ignore that email issue for a minute - the fun apps are in very short supply. From the list of my most useful iPad apps, I was able to find a browser, a basic RSS reader, a note-taking tool, Twitter client, and I’ll throw in a Facebook client which iPad doesn’t have. From the list of my coolest iPad apps, I didn’t find a single one. The key to the PlayBook’s success will be RIM’s ability to attract developers. Right now, I am a bit skeptical. However, there have been some reports about the PlayBook’s ability to support Android apps in the near future. Should that come true - and should the apps run in a realistic mode with full capabilities - RIM might pull a great coup and address the lack-of-apps issue overnight. But until that happens, the PlayBook’s outlook is questionable. My son is testing the 'play' part of PlayBook. He enjoyed the Flash support. The PlayBook is a beautiful, well designed device. Assuming the apps will become no issue, it will be a solid option for many users, particularly those using it primarily for business. Besides the native office apps, PlayBook also leverages RIM’s security infrastructure and offers a much more secure option than Google or Apple. But the apps are a major issue today and with pricing on par with iPad ($599 for a 32 GB version), the PlayBook is hard to justify in comparison to the iPad.